Other risk events cannot be simulated in a secure manner. For more information about this risk event, see Sign-ins from anonymous IP addresses. The Tor Browser to simulate anonymous IP addresses. You might need to use a virtual machine if your organization restricts using the Tor browser. A test account that is not yet registered for multi-factor authentication. Using the Tor Browser, navigate to https://myapps.microsoft.com. Enter the credentials of the account you want to appear in the Sign-ins from anonymous IP addresses report. The sign-in shows up on the Identity Protection dashboard within 10 - 15 minutes. For more information about this risk event, see Sign-ins from unfamiliar locations. To simulate unfamiliar locations, you have to sign in from a location and device your test account has not signed in from before. VPN connection, to simulate new location. Virtual machine, to simulate a new device. At least a 30-day sign-in history. When signing in with your test account, fail the MFA challenge by not passing the MFA challenge. Using your new VPN, navigate to https://myapps.microsoft.com and enter the credentials of your test account. For more information about this risk event, see Impossible travel to atypical location. Simulating the impossible travel condition is difficult because the algorithm uses machine learning to weed out false-positives such as impossible travel from familiar devices, or sign-ins from VPNs that are used by other users in the directory. Additionally, the algorithm requires a sign-in history of 14 days and 10 logins of the user before it begins generating risk events. Because of the complex machine learning models and above rules, there is a chance that the following steps will not lead to a risk event. You might want to replicate these steps for multiple Azure AD accounts to publish this risk event. Using your standard browser, navigate to https://myapps.microsoft.com. Enter the credentials of the account you want to generate an impossible travel risk event for. Change your user agent. You can change user agent in Internet Explorer from Developer Tools, or change your user agent in Firefox or Chrome using a user-agent switcher add-on. Change your IP address. You can change your IP address by using a VPN, a Tor add-on, or spinning up a new machine in Azure in a different data center. Sign-in to https://myapps.microsoft.com using the same credentials as before and within a few minutes after the previous sign-in. The sign-in shows up in the Identity Protection dashboard within 2-4 hours. Vulnerabilities are weaknesses in an Azure AD environment that can be exploited by a bad actor. Currently 3 types of vulnerabilities are surfaced in Azure AD Identity Protection that leverage other features of Azure AD. These Vulnerabilities will be displayed on the Identity Protection dashboard automatically once these features are set up. Azure AD Privileged Identity Management. This section provides you with steps for testing the user risk and the sign-in risk security policy. For more information, see How to configure the user risk policy. Sign-in to https://portal.azure.com with global administrator credentials for your tenant. 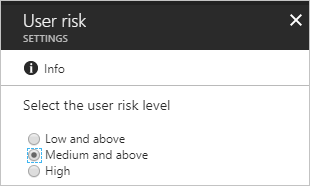 On the Azure AD Identity Protection page, click User risk policy. In the Assignments section, select the desired users (and groups) and user risk level. In the Controls section, select the desired Access control (e.g. Require password change). As Enforce Policy, select Off. Elevate the user risk of a test account by, for example, simulating one of the risk events a few times. Wait a few minutes, and then verify that user level for your user is Medium. If not, simulate more risk events for the user. As Enforce Policy, select On. 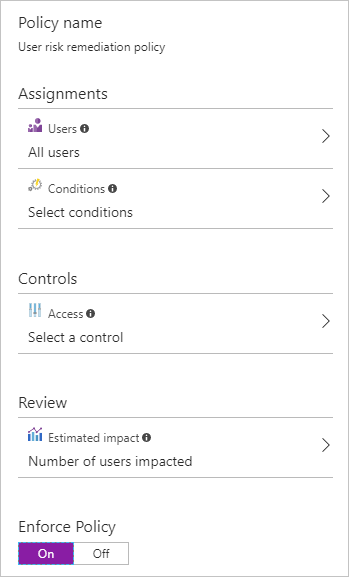 You can now test user risk-based conditional access by signing in using a user with an elevated risk level. For more information, see How to configure the sign-in risk policy. Navigate to Azure AD Identity Protection. 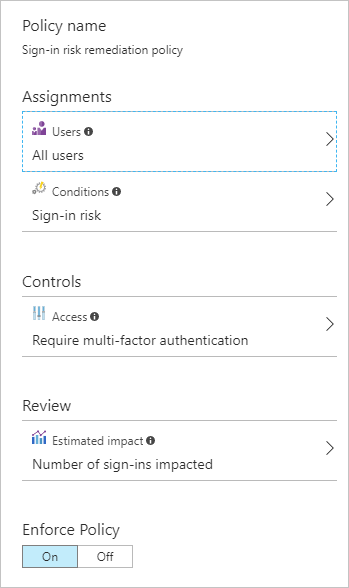 On the main Azure AD Identity Protection page, click Sign-in risk policy. In the Assignments section, select the desired users (and groups) and sign-in risk level. In the Controls section, select the desired Access control (for example, Require multi-factor authentication). 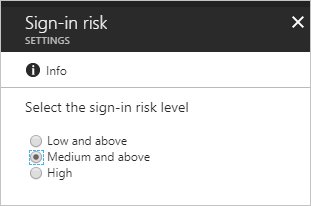 You can now test Sign-in Risk-based conditional access by signing in using a risky session (for example, by using the Tor browser).